The lightweight rucksack with aluminum frame was developed by Natick Laboratories for cold weather and mountain use as an initial effort to develop lightweight load-carrylng equipment in 1961. It weighed 3 pounds (1.4 kg) as compared to the 7.5 pound (3.4 kg) cotton rucksack with steel frame (8465-261-6931) which it replaced. lightweight rucksack with a canteen in a cover attached to the side hanger and secured by a tiedown strap. 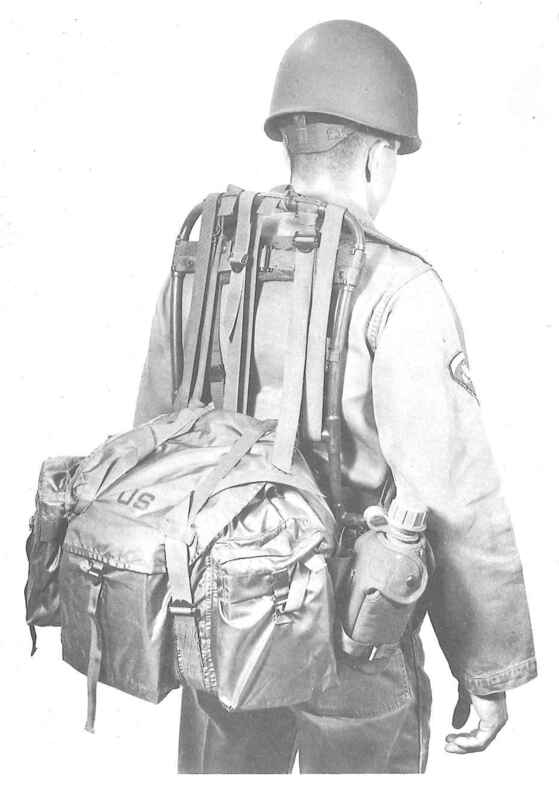 The aluminum frame gave the load stability on the wearer's back, and the nylon pack, with a capacity of 1.15 cubic feet was almost twice as large as the M-56 pack (.67 cu ft). Furthermore, a small demountable platform was provided which could be attached at the bottom of the frame; this shelf made it possible to carry items like a five-gallon water can, and thus served as a lightweight packboard. Rottman, Gordon L. (January 26, 2017). Vietnam War US & Allied Combat Equipments. Oxford, UK: Osprey Publishing. Monroe, C. A., Pickrall, Craig. (2012). American Web Equipment 1967-1991. Marlborough, Wiltshire, UK: The Crowood Press.